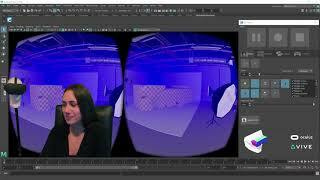 Make Virtual Reality with VR-Plugin Professional. VR-Plugin brings Autodesk® Maya® Viewport 2.0 content to your Virtual Reality device (Oculus Rift and HTC Vive with 90 FPS Stereo). Working in VR gives you the ability to get a feeling for scale and scene proportion. The Professional license will give you the full feature set including high fps recording of HMD, hand controller and gamepad input. Use VR-Plugin for presentations, previz, set design, animation, camera work including live stereoscopic camera adjustments and recording. Benefit from 1:1 conversion to your final product e.g. Unity3D, Unreal Engine or Stingray. VR-Plugin is also great for approvals. Please visit our website www.VR-Plugin.com for more information. The VR-Plugin Professional annual license covers the use for one supported device on multiple workstations. The registered HMD will perform as your licensing dongle. Visit our website, sign into the forum and download VR-Plugin 6.0 Beta 3. This plug-in has been extremely useful. Super easy to install and get started on what I needed it for right away. No latency, great performance. Thanks for making such a great plug-in!